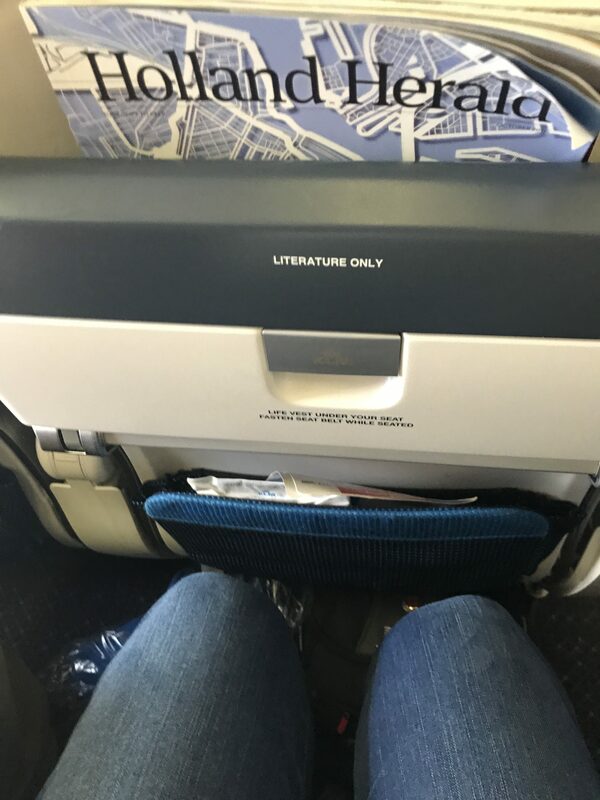 I found the legroom adequate and not tight. Getting in and out was an effort and requires suppleness unless you climb over the armrests and slide into the seat. The seats seem hard in the beginning but on an intercontinental flight they are much better than a softer seat. "aisle armrest cut into my hip"
I'm 6'3". 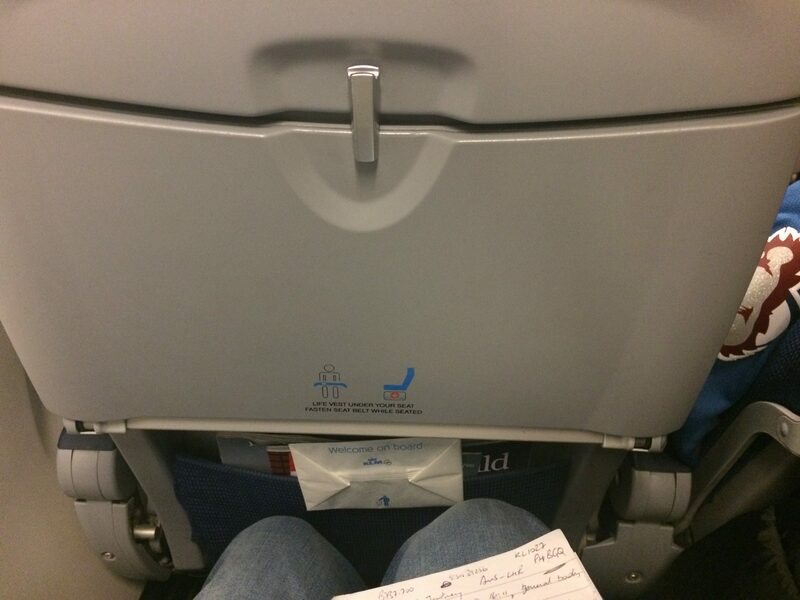 The only time I've ever had adequate leg room is when I get a bulkhead or emergency exit seat. I requested a seat in the expanded leg room rows but got stuck two rows further back. The aisle armrest cut into my hip and the inside armrest only raised about 60 degrees. If over 5' and wider than 16" forget about easy ingress/egress for your seat. 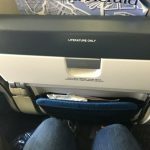 My husband and I flew from Chicago to Amsterdam in the economy class. 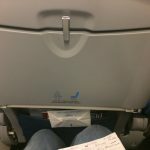 The armrest did not raise on the flight to Amsterdam but on the return flight it did. This made no difference. It was very uncomfortable seating. I am 5' 4" and weigh 145lbs. I could not get comfortable. I could not move my legs. My husband is still complaining about hip pain due to the tight seating. It was a 13 hour night flight from Singapore to Amsterdam. The worst thing about the seat was its hardness. However I twisted I could not get comfortable and sleep was barely possible. I will not fly KLM again for a long haul flight because of this. 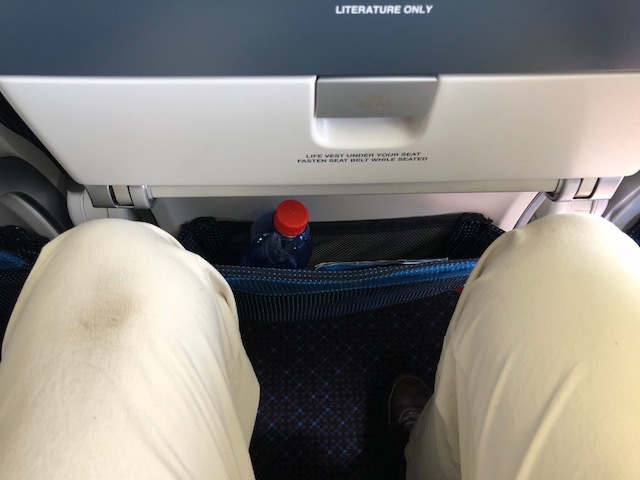 "they try to rip you off"
KLM is flying from AMS to PVG with the "Vintage KLM 747-400 Combi" No individual tv screens no leg room (I am only 1.75 mtr tall). 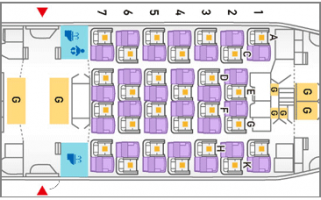 They have now introduced the Premium Seats in the old Business Class section (better known as the "pijpenla") and they try to rip you off at an additional EURO 125 per flight sector (one way) to have more leg room. I am Dutch and live in Shanghai but when I can avoid it I do not fly KLM anymore. Shame on KLM it used to be one of the best airlines in the world now they are just the low cost carrier for Air France. Very tight seats. My knees were cramped an if the passenger in front of me reclined his seat I couldn't move anymore! AVOD was very hard to see when reclined. "I found the seats tight"
It seemed like a new plane and had personal screens for entertainment but I found the seats tight. I ended up climbing across the armrests to get in and out of my seat. Once the seat in front of me was pushed back I had to slouch down in my seat to see a decent image on my screen. I'll avoid KLM in the future. Completely ridiculous small seat pitch in such a large aircraft for such a long flight (more than 10 hours). The seats were old no private screens but central placed screens. Although I am Dutch I will never fly KLM again. 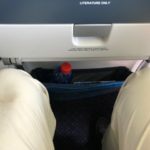 "the best seats in economy"
SFO-AMS and AMS-SFO. The last 3 rows or so have only 2 seats between the aisle and window. These are the best seats in economy. You'll be the last off but much more comfortable on a 11 hour flight. Lots of room on the side of the window seat for carry on. More engine noise. I thought FAs were reasonably polite. JNB-AMS. Little 37cm overhead TV's are archaic serve no purpose whatsoever. Im a small sized woman (aisle seat) and my Husband small (middle seat) and fortunately the lady sitting on the window seat small too even with this when ever either of them needed the loo it was event we eventually all went together- all out all in scenario. They say Holland is the land of Giants well what airline do they travel on? Sat in row 52 right opp kitchen- smelly noisy and what later became an emergency ward for a a passenger who fainted (probably from the claustrophobia). Can only hope trip home via Paris is on one of Air France's new air-busses.